I am so excited for today!! It’s National Peanut Butter Lovers Day! What a great way to start out a month. Celebrate today with a little (or a lot) of Peanut Butter. If you can, make your own Peanut Butter. You check out my a few of my recipes on my recipe page or here is my basic one for Apple Cinnamon Peanut Butter. Since today is a special day, I have a little giveaway for you and I started my very first blog hop. 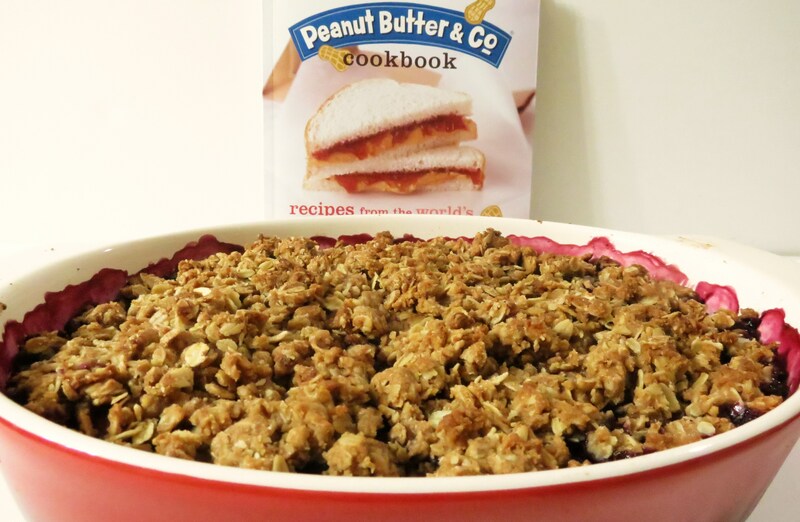 For my blog hop, all you have to do is add one or all your favorite Peanut Butter recipes. Now I know you have a few, I see them all the time, so post them, I want to make them. You know me and peanut butter!! Plus the code is below, so you can add it to your blog, if you’d like. I saw this little book pop up in my e-mail last week, and I just had to buy it, and I had to buy one for you. 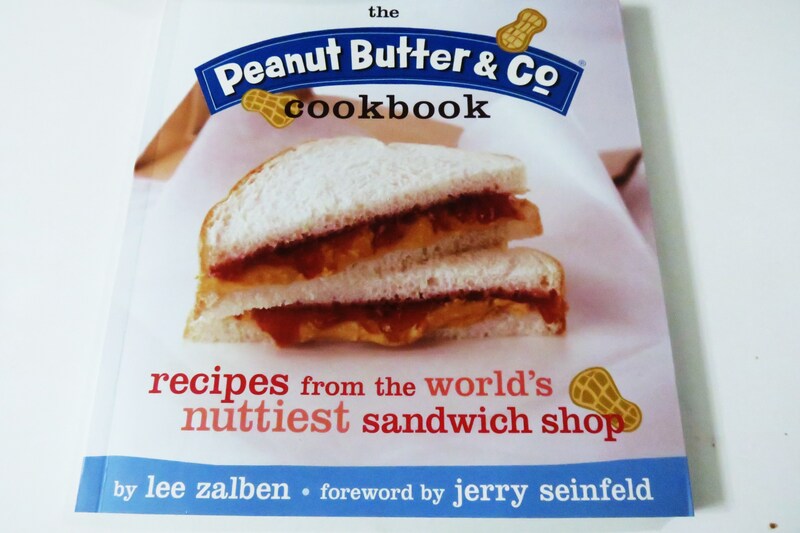 It’s the Peanut Butter & Co Peanut Butter Cookbook. Oh man, this book is filled with delicious treats. There are dishes like grilled PB&J sandwiches, Peanut Butter Waffles, Peanut Butter Blondies, Peanut Butter and Shrimp, oh the list goes on and on. 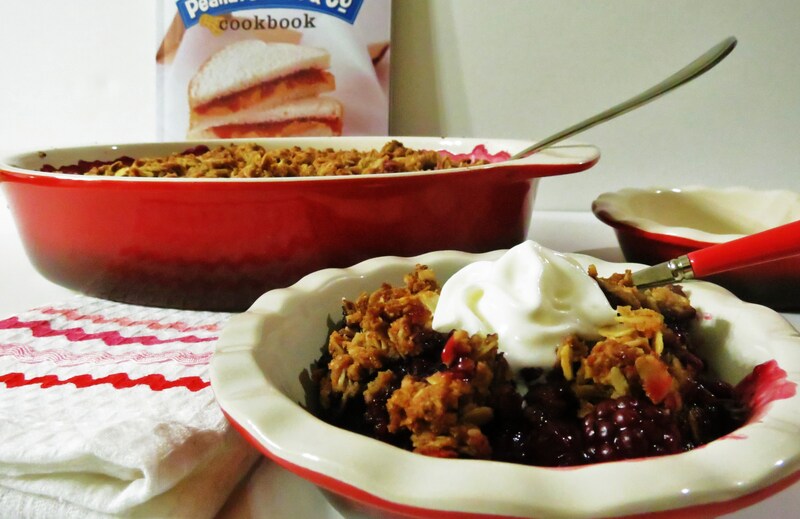 I made a dish from the cook book which is Peanut Butter and Berry Crumble. Hot dam does it taste good! 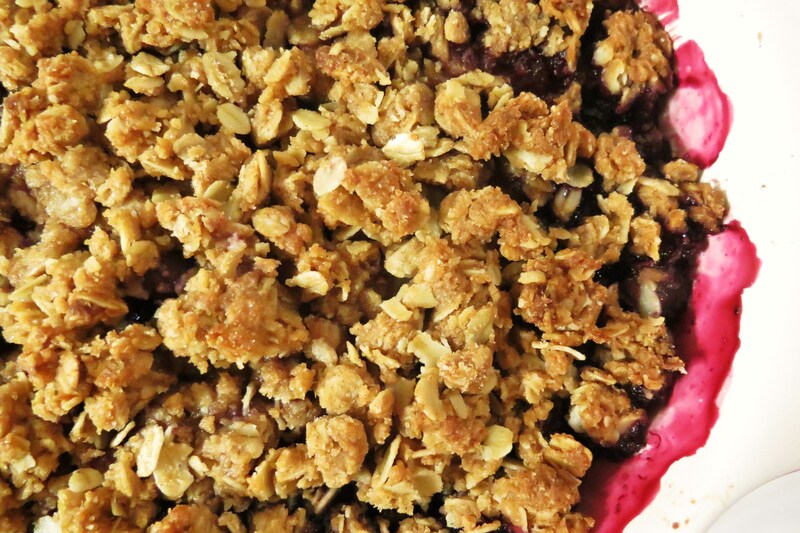 The topping to this crumble is unbelievable. It’s full of peanut butter, oats, brown sugar, flour and butter. It tastes amazing and it’s great on oatmeal and yogurt. Or served warm with ice cream. I love my crumbles, but this one is probably the best. Just look at the Peanut Butter clumps. In this recipe I used frozen fruit instead of fresh. You will bake it cook for 20 minutes with fresh fruit and about 45 minutes for frozen fruit. If the top gets to brown, just cover with aluminium foil. It cooked perfectly by doing that. Also I cut the butter and sugar down just a little in this recipe and it was sweet enough. I’ll be honest with you, the calories are high in this dish. That is why I use it for a topping on my yogurt. 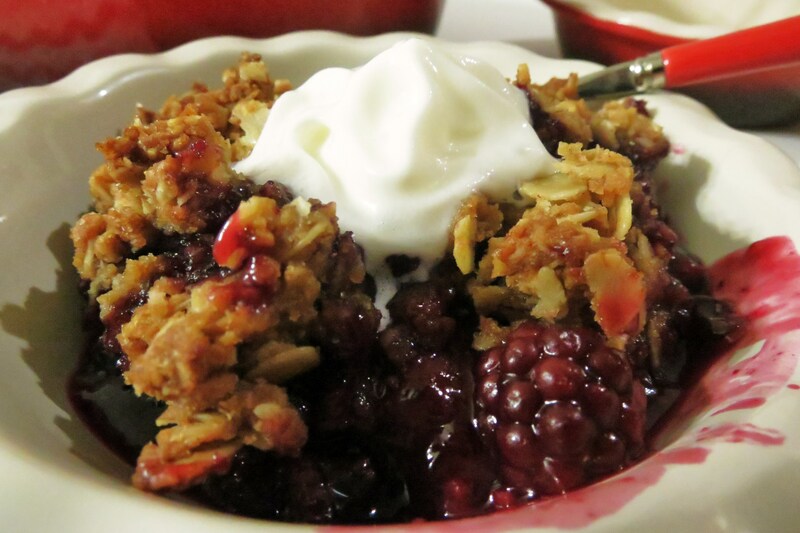 Since this is fun giveaway and a special day, I won’t tell you the calories, you just need to enjoy the day and this wonderful sweet crumble. In a large bowl combine cornstarch, lemon juice, and 1/4 cup cold water. Stir until cornstarch is completely dissolved. Add granulated sugar, blueberries, raspberries, strawberries and blackberries, and mix gently so as not to bruise the fruit. Place fruit mixture in an 11 x 7 baking dish. In a separate bowl, combine rolled oats, flour, brown sugar, cinnamon and salt. Cut in butter and peanut butter, stir until the mixture is consistency of coarse meal. Sprinkle on top of fruit mixture and bake for 20 minutes or until top is golden brown. Serve warm with ice cream. For the giveaway: I am giving a brand new, never opened Peanut Butter & Co. Cookbook, a jar of my homemade Maple Cinnamon Peanut Butter (best PB ever, I’m not kidding about that!) and a few other goodies, that will be a surprise, but it will make you happy, trust me. To enter, all you have to do is tell me your favorite Peanut Butter Recipe or Treat. The giveaway ends on Sunday, March 11th, at 12 noon. I’ll pick a winner through random.org and announce the winner on Monday. Now don’t forget to add your favorite Peanut Butter Recipes. Add as many as you like. If you would like to add the collection to your blog, so others can see the wonderful Peanut Butter recipes you entered. Now don’t be surprised if I steal your recipe and place it on my blog. Don’t worry, I always give you the credit and the link to your blog! 🙂 Oh and I’ll be placing some of my favorite recipes too!! Happy Peanut Butter Lovers Day!!! Now go eat some Peanut Butter and enjoy every last lick of it!!! Grabbing my spoonful right now! What a fabulous giveaway! Happy National PB day to you too! * These are bacon pancakes but i omit it, not really a pork eater =/ although im sure the combo tastes fantastic! *chobani, granola, PEANUT BUTTER, and a drizzle of honey. *whole wheat tortilla, peanut butter, banana all rolled up nicely! * honey crisp (my fav apple), peanut butter (or almond if i have in pantry), on a piece of millet bread! nomz! *rice cake w/ peanut butter once again =p and applesauce or jam. And finally a cookie recipe (only appropriate). I love love love Eating Bird Food’s blog! Shes wonderful! Her PB cookie recipe is so easy to do and i love that it only requires 5 ingredients!! FIVE, that’s it! Preheat an oven to 350°. In a bowl, combine all the ingredients and stir until it all has come together. Line 2 baking trays with parchment paper. Tear chunks of dough off from the bowl and roll in between your hands to make dough balls about 1 1/2 inches thick. Put the balls about 2 inches apart on the lined baking sheet. Dip a fork in water and press down twice on each dough ball in a perpendicular fashion to make a crisscross pattern. Bake for 12-14 minutes, or until the edges firm up and the center is beginning to set. Let the cookies cool completely before trying to lift them from the tray. Wow, what great recipes, I want to try them all out!! Yum!!! The pancakes look super delish!!! I’ve made puppy chow and I love it, so addicting!! As for the giveaway, I’m following you on twitter, I’ve tweeted about your contest, subscribed to newsletter and like you on FB! Thank you for the giveaway and Happy Peanut Butter Lovers Day! How can you not be in a good mood on a day like this?! My favorite peanut butter recipe has to be a peanut butter (homemade, of course), cocoa powder, frozen banana, and almond milk smoothie! (emphasis on the peanut butter) It probably accounts for half of the smoothie. I like you on Facebook (An Organic Wife)! My favorite easy treat with peanut butter is to just have a banana and a spoonful of peanut butter! Dip banana in PB…yum…sometimes I’ll drizzle honey into the PB too. Otherwise, I LOVE Special K Bars, although I call them Special Krispie bars since I use Rice Krispies instead of Special K cereal. Bring sugar and corn syrup to a full boil in a pot over high heat. Remove from heat and add peanut butter, stir until ‘melted’ together. Add cereal and gently mix. Spread mixture into a buttered 9×13 pan. Melt chocolate and butterscotch chips together. I have “liked” you on Facebook. I am new to your blog and look forward to browsing through it more! My favorite peanut butter treat? Yea I don’t think I could ever narrow it down, but I suppose the buckeye truffles have a special place in my heart. Especially since they ratio of peanut butter to chocolate is so great! Oh and I had no idea they had their own cookbook – hoe freaking fantastic is that?? Oh, the buckeye truffles sound amazing! Ok, right in the middle of this post I had to stop and check out your recipe and they look super yummy and super addictive!!! My favorite pb recipe would have to be the simple peanut butter and banana. Soo yummy! I love frozen banana with peanut butter in between!! Yum! I love the idea of a peanut butter focused cook book!! My favorite is a Peanut Butter, Cinnamon and Kiwi Sandwich on thick slices of warm dense freshly baked 7-Grain Bread…soooo good! Huh, thats different! kiwi and peanut butter. I have to try that combination, I bet it would be really good!! YUM! I love peanut butter and apple butter Sammies!!!! I follow you on fbook!! I just love peanut butter cookies 🙂 Live in NYC and still haven’t been to peanut butter co. FAIL! dangit! I need this cookbook! How in the world do I pick my favorite PB recipe? Anything with PB and Chocolate is right up there. Buckeyes, PB brownies, peanut butter cups, the list goes on! Very happy to add your button to blogs I enjoy reading on my blog : ) Welcome Friend! My favorite peanut butter treat is oat muffins with peanut butter. Man, I want this just for your homemade peanut butter! Awesome giveaway Jen!! I already follow you by email, FB and Twitter 🙂 I shared your giveaway on Twitter. My favorite peanut butter recipe is Spicy Peanut Chicken! I have to say my favorite treat is peanut butter cups, 2nd is a Golden Delicious apple with peanut butter. The latter is especially yummy on a toasted whole wheat bagel. I have never tried Peanut Butter & Co. but saw them on a Travel Channel show; have wanted to try ever since. This is such a FUN giveaway! I have ONE peanut butter recipe to share, but I just love it! Currently loving banana, peanut butter & honey muffins, and peanut butter & jelly crumb bars! Amazing giveaway!! I love peanut butter :). I think my favorite peanut butter treat is anything that combines it with chocolate haha…so peanut butter cookies with chocolate chips, peanut butter cups, or brownies with pb! I now subscribe to your posts! 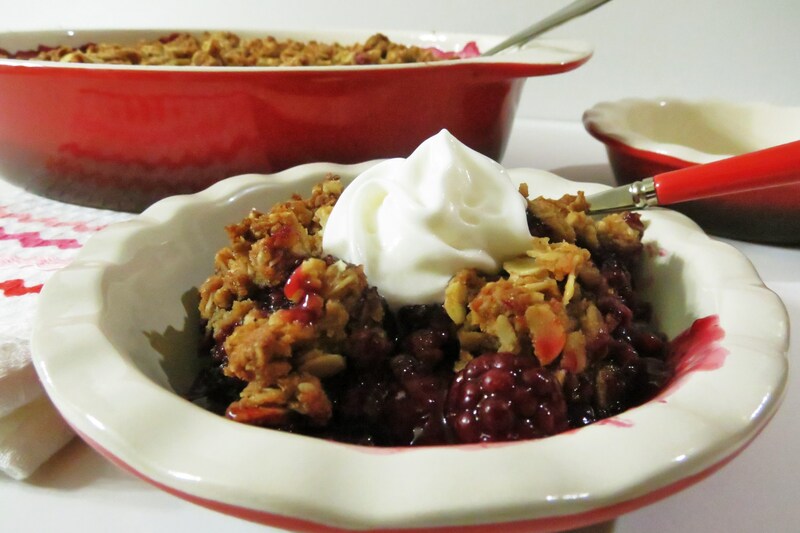 That crumble is to-die for. For real. My favorite peanut butter treat are peanut butter and jelly bars. I love Ina garten’s recipe! plus, I follow you on twitter! OMG! Everything looks so good on your blog! I am bookmarking it so I can make your peanut butter treats. I tried to leave a reply on your blog, but it wouldn’t allow me. This is gong to be a good peanut butter weekend!!! For National Peanut Butter Lovers Day I made these cookies and they are amazing. They taste just like homemade Girl Scout Do-Si-Dos. The only tweak I made to the recipe is I used skim milk instead of heavy cream for the filling and it was still amazing. I also have an email subscription! my favorite peanut butter item is keeping it simple with some apples! im obsessed with fruit and peanut butter…so why not have them together?! I couldn’t agree with you more! I love peanut butter with just about all my fruits, apples and berries are my favorite! My favorite peanut butter treat is getting a spoonful of peanut butter and dipping it into a bag of dark chocolate chips, it’s like CRACK! As I was reading this a piece of PB toast was devoured… no joke, I LOVE PB! Sharing one of my favorite recipes for chocolate covered peanut butter pretzel cookie dough balls above! Want to know something funny? When I was looking for your German Brownie Bites I found the Peanut Butter Pretzel Cookie Dough Balls on your blog and left the page open on my computer, so I could make them after dinner. Great minds think alike! 🙂 It was meant to be, making them after I write my blog! My favorie peanut butter recipe is my caramel stuffed peanut butter and pretzel truffles with candied bacon. A PB & Jelly sandwich on whole grain bread is my favorite – pretty original sometimes I’ll add chopped strawberries, raspberries, blueberries or apples to it too! Frozen peanut butter pie is my pb yummy treat choice! I like peanut butter truffles – that melt in your mouth with peanut butter creamy in the center! I am peanut butter OBSESSED! (a) straight out of the jar — dangerous! I can’t eat oatmeal without PB anymore, but since I do that nearly everyday, I don’t really consider it a “treat” anymore! It is kind of a tie between peanut butter filled pretzels and good old peanut butter cookies! Grilled peanut butter, nutella, and banana sandwiches! Amazing. Anything with peanut butter and bananas…oatmeal, sandwiches, smoothies, you name it. Not very original but very true! I think my favorite PB treat is the Reese’s eggs…I found a recipe for homemade ones and I can’t wait to try them!! Subscribed via email!! So excited about this giveaway! There must be a rule that all Jennifer’s love peanut butter! I am not an exception. I completed all 5 tasks above. Hope I win. I have liked you on FB and subscribed to email. Thank you for having the Giveaway! I am so obsessed with PB, and I’ll eat it on or in almost anything, but when it boils right down to it PB & Banana sandwiches are my favorite way to eat it. No matter how many peanut butter treats I have, one thing I could always eat a whole pan of is plain old Special K bars! Great giveaway! I subscribed for email posts! I Like Peanut Butter and Peppers on Facebook! Love peanut butter with jam on my morning breakfast toast! I like peanut butter blended in my banana protein smoothie with almond milk too! Rich and creamy! My favorite peanut butter treat is these Peanut Butter Chocolate Chip brownies I get from the farmers’ market! I make an especially rich chocolate pie and you have inspired me to stir some PBS into it after I pour into the crust. It makes an incredible swirly pattern and tastes yummy! My favorite peanut butter treat is Peanut Butter Rice Krispies Treats with chocolate drizzle. Combine all ingredients in to of double boiler. Place over simmering water and stir until smooth. Once smooth, cook 5 min. constantly stirring. Spread in buttered 8” or 9” round or square pan/dish. I liked you on Facebook. I would love the cookbook bc I LOVE PEANUT BUTTER anything! Peanut butter and banana. Mash it together with a fork and eat it with a spoon! Yummy!!! And I subscribed to your blog. Thanks for the giveaway, but I’m just glad to have found you on Tasty Kitchen. Peanut butter rice crispie treats – ooh la la!! My favorite pb recipes are always the ones that pair with chocolate! I think my most favorite is devil’s chocolate cake with peanut butter buttercream! I die! My fave PB treat…I have about 20 things that I make that are in my Top 10 list 🙂 So hard! Cookies with white chocolate chips, a cake bar I make with it, or frosting. Love the giveaway and I WANT this book!!!!! !